Babies of all ages will love looking at this delightful fold-out book. The colourful pages fold out to make a frieze to look at and talk about. One side has pictures with strong contrasting colours that will appeal to very young babies, while the other has a bright Christmassy scene of Santa and his elves to enjoy. A jolly fold-out book filled with iconic Christmas images, such as snowflakes, stockings and presents. 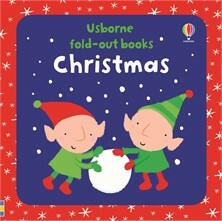 A great way to introduce young children to the magic of the festive season.